This week is the first week there is no day camp going on since the start of the summer. Its bittersweet. I know that Joe is glad to be able to not be running in a gazillion directions, but I know he also (as I and the kids do) misses having the young energetic kids and college kids around. As busy as it gets in the summer time, having day camp here is a highlight to get to work with summer staff and hear sweet young voices around camp. 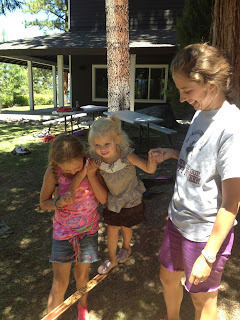 The day campers just loved having Nate and Chloe around and my kids adored them. It was fun to get to look out my front window to my lawn and have it be full of kids doing bible study, playing games, or enjoying a popsicle at the end of a scavenger hunt. I was super blessed by the counselors this year as they went an extra mile to help me with my kids when they could and Nate and Chloe just lit up anytime they saw them. They even babysat for us a few times! And of course, Friday afternoons when we got to join in the slip and slide festivities were a blast. The boss and his side kick had to join in the fun as well! The archery net comes down today. It was a great summer for ZP Day Camp. We were glad to be a part of it.